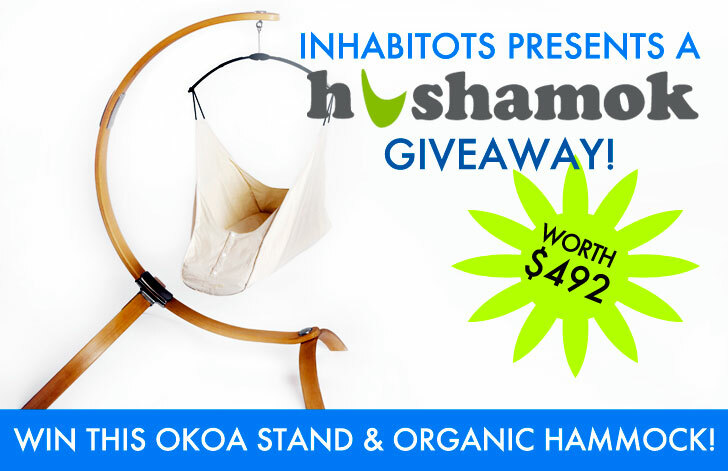 LAST CHANCE TO ENTER: Win A Hushamok Organic Baby Bassinet Hammock, Worth $492! Sleep is the Holy Grail of parenthood — yet most new moms and dads are shocked by how elusive slumber becomes once baby arrives. The designers at Hushamok know how important it is for moms, dads and newborns to catch some shut-eye, so they created a dreamy sleeping haven for baby in their Organic Baby Hammock and Stand. Designed to provide a cozy transition to life outside the womb, Hushamok’s organic hammock is an ingenious alternative to baby bassinets or cribs. The hammock‘s natural swinging and rocking motion helps induce sleep and enables baby to sleep longer. Babies suffering from infant colic and reflux will also be especially comforted and relieved by the constant swaying motion. The hammock comes with two matching organic sheets, and a mattress that is entirely free of flame retardants. The stand is crafted from sustainably harvested European Beechwood, a wood chosen especially for its wear-resistance and strength, and is held together with aluminum castings, which receive top marks for durability, recyclability and sustainability. 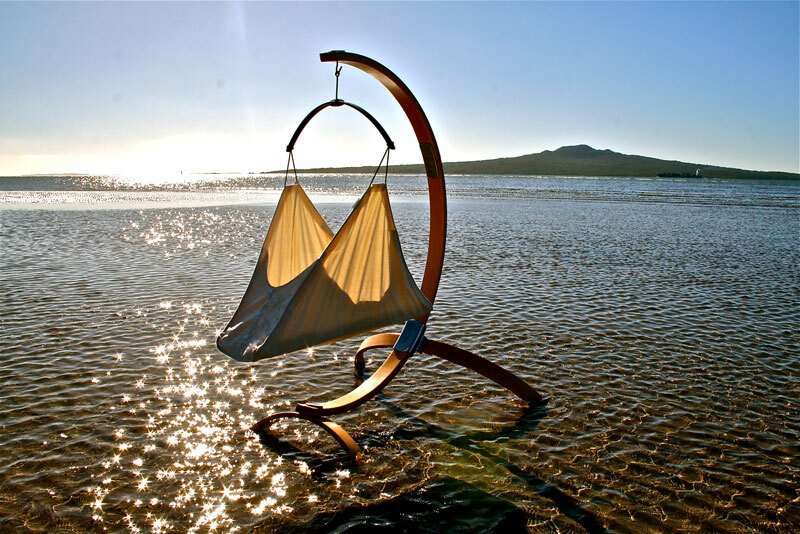 Hushamok’s hammock and stand’s sleek design also makes it a gorgeous, aesthetically pleasing addition to any space. We’re thrilled to be giving away this beautiful Hushamok Organic Baby Hammock and Stand worth $492 to one lucky Inhabitots reader. 1) Sign up for the Inhabitots weekly newsletters (if you haven’t already)! We’ll be notifying the winner in Inhabitots’ newsletter – so you need to sign up and receive our newsletter to find out if you have won. 2) Like Inhabitots on Facebook. 3) Like Hushamok on Facebook. 4) Add a comment to this post with your answer to the following question: What bedtime story do you most look forward to reading with your child, and why? NOTE: Please be patient – comments don’t appear instantly because they must be approved. Contest ends Tuesday, October 16th, 2012 at 11:59 p.m. EST. Winner will be announced in our newsletter on Friday, October 19th, 2012. Good luck! And while you wait to find out whether you’ve won, enjoy a 10% off discount on any purchase you make at www.hushamok.com, using the coupon code: DESIGN10. *Discount offer ends on November 2nd, 2012. I wouldn't mind having one of those for myself! Mommy and Daddy love to read On The Night You Were Born by Nancy Tillman to our precious 19 month old little boy. We are trying for baby #2. We would be so lucky to win this! I really look forward to reading Goodnight Moon to my kiddos. It's not too long and it's such a great peaceful, wind down book to read right before bed. "A" is for Anacostia because the book portrays the Anacostia neighborhood with a rich sense of community. We are now happy parents of a baby girl and we have a 4 year old son as well and he loves to "read" to the baby the story of "Snowflake", the story relevant to the festival Michaelmas. It tells of being born into the world anew and having to face being alone, and darkness, then taming the dark to find the light, and finding your light and not being alone anylonger. I think he likes it mostly because of the dragon that's in it. On a different note, we would and could use a wonderfully designed piece of hammock comfort for our little one to soothe her so that I can spend more time with my boy! The little prince because it is rich with wisdoms and it is suggestive!. The little prince because it is wisdoms rich and it is suggestive! I tell you what happened during the day. Sending positivity, happiness and imagination. Because it is important to give them peace and joy. And make them live in a peaceful and let them share in all that happens. I love reading Tiger Can't Sleep with the kids. It's so funny. My favorite bedtime story to read is Goodnight Goon. It's a leap from the days when I read my daughter Goodnight Moon. It cultivates a sense of humor and is especially fun to read with Halloween approaching! I most look forward to reading my 20month son Xavier a book called 'Good Night Owl'...as on the last page he always kisses the owl good night. This melts my heart ever time...the affection children have is so powerful. Love you forever - Robert Munch. A classic story I loved as a child and can still recite word for word. Harold and the Purple Crayon is my fave. It is simple yet creative! Goodnight moon was always a fave. The Lorax! Because its about using resources wisely and listening to others. Timeless messages. Time for Bed by Mem Fox is a lovely classic story that always puts a smile on our faces. Clifford the Small Red Puppy was always my favorite and I am looking forward to reading it again. My little baby girl would love this; the book I look forward to reading to her is "love you forever"
Winnie the Pooh! It is my all time favorite that my parents and grandparents read to me and I want to be able to share that. We love to read "that's not my monkey" because it's a touch and feel book! Goodnight moon is for sure our favorite. Its a classic in my eyes and its nice because its repeative and short (LOL) but still effective. Go Dog, Go! The text and illustrations are fun, simple, and memorable -- brings back memories reading with my own parents. Hush Little Baby by Sylvia Long because instead of buying things like a mocking bird or a ring, this version reassures the child with the beauty of the natural world or with comforting items like a teddy bear or a book. because it's a fun book and never know what creative answer you will get back! My favorite book to read to kiddos is "The Three Questions" by Jon J. Muth. I just love the message of this book. It's about a boy named Nikolai, who is trying to find the answers to three important questions in life so he will always know how to be a good person. He ends up finding the answers (and inner peace) by helping others along the way. My toddler loves this book, but my new babe is still a bit young for this. I can't wait to share the story with her too. We love reading Chicka Chicka Boom Boom, My daughter will always sing/read along, but towards the end she will slow down until she eventually falls asleep. Too cute for words! love you forever...i cry every time. my baby would love this hammock!! We love to read Where the Wild Things Are. I'm all about expanding my children's imaginations... the bigger the better! This book is perfect for letting the mind wonder. After ready this book it's easy to paint one of the scenes, act our favorite parts out, or just have a funny conversation about the book. Gobble gobble crash or ready set skip. Both are really fun to read. Gobble Gobble Crash or Ready Set Skip. Both are really fun to read! When my nieces and nephews were little I loved to read them the book "Love you forever" by Robert Munsch. Now that they are growing up having families of their own I enjoy reading it to their children. I read tge little prince to my little princess! It was read to me as a child and my month and a half year old loves it!!! 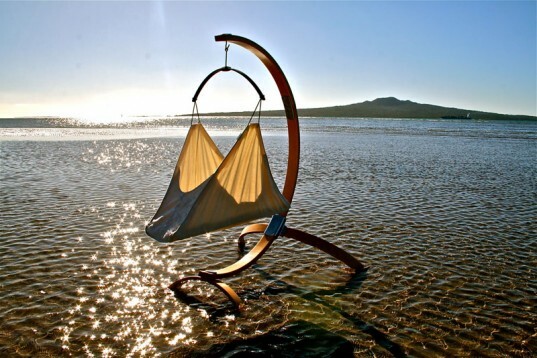 This hammock looks so amazing! Would be so excited to win and rock my angel to sleep in it! We love to read Llama Llama Red Pajama at bedtime! The Story of the Easter Bunny by Sheila Black, it is a great story that teaches children three main lessons, to just be themselves, to accept others for who they are and to help those in need without worry about what is in it for them. I absolutely loved this story as a child and the illustrations are wonderful. the dictionary. I want him to expand his vocabulary and exerciser memorization. I can't wait to read "The Very Hungry Catepillar", it was my favorite book growing up!! I look most forward to reading Canada 123, as I enjoy doing all the sound effects, and he really likes it! For younger babes I am excited for The Very Hungry Catepillar. For older ones, Anne of Green Gables - it was my favorite book growing up! I like to read the ones I always liked in my childhood. One is about a girl which walks in the snow seeing fishes under the ice and birds and all the other animals that live near us. Our favorite thing to read is a book our older daughter made for her little sister's birthday. It has nursery rhymes and pictures and includes our little one in some of the rhymes. It's amazing. My guy loves reading "snuggle puppy" every night. We also read a First Words book, and at 15 months he says or signs most of the words now! I will be reading "Green Eggs and Ham" by Dr. Seuss in May to my new baby! The Snowy Day by Ezra Jack Keats because it is a slow gentle read and makes them look forward to a day in the snow. Jesus Loves Me.......I love ready it to Landen and he seems to understand the LOVE Jesus has for us as well as the LOVE I have for him!! "Goodnight Moon" is our favorite bedtime story! Frankly, I love classic fairy tales story "Sleeping beauty"..This story inviting the child to use words to make beauty picture images of their own and teach to child that love and goodness conquer all.. The Sleep Book by Dr. Seuss, it rhymes so lovely! I love reading the Paper Bag Princess to my daughter who is 5 months and my 4 year old son loves all seek and find books. Where the Wild Things are ....because it encourages imagination and was my favorite book as s child. My favorite book to read to my daughter is called Tenzin's Deer. It's about love, caring, healing, nature and not holding on to something. Its beautiful! That's not My Bear, and That's not My Monkey. They are still favourites for our 3 year old. We reading her love "Corduroy" because it's a favorite of ours. And such sweet illustrations! "eddie, the lazy bear". My mom used to tell me that story, and it's just perfect to sleep! Our baby is due November 1, 2012. We don't know what it is yet but we do know it will be loved. the story i look forward to sharing with our child is called a new blanket. It is about an old woman who lives in a drafty old cabin. Her grown children each bring her a new blanket to stay warm but she hands these off to her cow, goat and dog, recognizing them each for the help they afford her. It is a beautiful story that extoles the virtues of gratitude, selflessness and love. Anything, I would be happy to read a shopping list to my future baby. The joy of having a baby and just being about to sit and read before bedtime would be amazing. Where the Wild Things Are, It's a favorite from my childhood. A Color of His Own by Leo Lionni-a classic story about wanting to belong and friendship with beautiful watercolor illustrations. I can't wait to read classics like Little Red Riding Hood and and Hansel and Gretel. They are a bit on the dark side but for some reason i knew that it was just a fairy tale when I was little. A kids imagination runs wild with these stories and is able to keep going long after the story has ended. My favorite book to read to my 1 year old daughter is I'll See You In the Morning. It's such a cute little message about everyone and all the creatures going to sleep and to not be afraid of the dark. I actually saw this amazing organic hushamok after my daughter grew out of it and it would have been great for her reflux since I could never lie her flat. We are trying for baby number 2 so I would love to have this! We love to read THE TALE OF PETER RABBIT at night time to flourish their imagination. I love the series because it was passed down by two generations and always reminds me of our summers at grandma's house. My children love that I read the books in two more languages, as they get to know their parents native languages. With a new baby on the way, our daughter now picks books from the same series, explaining that she can't wait to read them to her new baby sister. Whatever childrens book my son decides, but we mostly own Dr. Seuss books and we both love them. How to chose just a single book? I like to read a variety of books to instill a love of reading and the written word at a young age. We read so many! But Goodnight Moon is an all time favourite, especially because my oldest can help read it to my youngest. Joel the Troll by William Friis. It's a wonderul book written for his grand children. I most look forward to reading Corduroy to my almost 3 month old twin girls because it was my favorite as a kid and its just such a heartwarming story. My favorite bed time book to read is Goodnight Moon right now to read to our 6 month old. It's a simple story with lots of opportunities to point out easy to say words. I've been replenishing my stock of early childhood readers, especially Sendak and Seuss. One I know I can't wait to read to this one is, "In the Night Kitchen." right now it is Once Upon an Ordinary School Day (Colin McNaughton (Author), Satoshi Kitamura (Illustrator)) My son loves it and the pictures are beautiful. He says, the words by himself all the time, so the book makes him happy. Ernie's Big Mess, it was my favorite growing up. My dad had it memorized and so did us kids =) It's fun to share that with my own children now. We used to read Goodnight Moon, but lately, Little Critter books have been the chosen pre-sleep read! Go Dog, Go! It was one of my favorite books when I was a child. I look forward to reading Goodnight Moon and Where the Wild THings Are because they were my favorites growing up! The story I look forward to reading the most is the hungry caterpillar, it was one of my favorites, just had my baby boy yesterday!!! I don't have a particular book that I like to read to my children, but I do love our ritual of mom, dad, and 2 girls snuggling down together in our family bed to read together every night. This hammock would be perfect for our newest addition-until s/he is ready to join us in the bed at night. the story of King David! Shmuel it starts and continues to Kings. It is a great inspirational story how to be humble and still dedicated to being right. It is a great story how to be a leader of a nation and still be a servant of God. It has its ups and downs and really makes you think about being successful in life. King David is the true hero of the common day. We don't know what it's like to have a king chase us, and then have our own son dethrone us. Me and my wife just got married a month ago and can't wait to have our first kid! She is already an aunt to over 20 kids. Shalom from Israel! Very Hungry Caterpiller is always a favorite here. The boys also love when daddy "reads" Good Dog Carl, he always comes up with a good story! I'm looking forward to reading The Warm Fuzzy Story by Claude Steiner with my son. It was my favorite story when I was a child. It taught me that love was meant to be given freely, rather than hoarded. Goodnight moon because it is so sweet and soothing to honor everything we are a part of. My personal favorite is where the wild things are. Neither of my daughters has enjoyed it yet but I find that I enjoy their favorites just as much even if I don't really like the book. The enjoyment they get from their favorites is more enjoyable to me than the book we are reading. Since the baby we are expecting is a boy I'm looking forward to seeing how his favorites differ from the girls. My three year old loves reading Angel in the Waters. I am pregnant with my second and we like to talk about the baby's home and the angel that lives there too. My son likes to find the little bunny in the Goodnight Moon and Runaway Bunny books. Goodnight moon is a classic! I love The Giving Tree. I love to read The Little Golden Books which I've saved all my life from my childhood. My mom used to read and collect them for me! Love you Forever! I loved that book as a child and share it with all of my children. I love to read the Nightlights books. They have really beautiful messages hidden in their lovely short stories. Through imagination and mediatation, the stories help our little boys find calm and the sleep they need! Books come and go - but our bedtime song never changes - Little Raindrop by Justin Roberts. Beautiful song for a beautiful guy. "Oh The Places You Will Go" Who wouldn't want to learn as much as your child? Ferdinand the Bull. Beautiful book, with wonderful illustrations. Shows children that it's alright to not be part of the crowd and to follow your inner voice. No need to be someone who you are not. We've been reading the Beatrix Potter books. I love the old-fashioned language and explaining what things are. They always lead to interesting discussions because they don't spell the moral out as much as modern books. Ryland gets not one but sometimes 3 bedtime stories read to him every single night without fail. He looks forward to either Mommy, Daddy, Ti-Ti..or a comination, to read to him! My favorite is whatever one that he picks out that evening..though a favorite lately has been "Good-Night Construction Site". There are so many! I believe that this is aVERY IMPORTANT part of his routine! we are reading this week.....it's the great pumpkin, charlie brown! Piper has discovered Halloween! she loves spooky reads! funny 2 yr old! hoping for a sibling! It would have to be the very hungry caterpiller to read to my 3 year old daughter. The hushamok is just like a cocoon so we can pretend to be caterpillars! The Very Hungry Caterpillar is a great book to read to your kids. Good Night Moon. It was my daughter's first favorite book. She wanted it read to her every night. Haven't read it to her in year since she is 14 now, but the story is permanent in my memory! I love reading to my children, but I cannot wait until they are old enough for me to read Roald Dahl books to them. My grandmother read Charlie and the Chocolate Factory to my dad and his brothers and my father read it to my sibliings and myself. I would love to pass on this tradition with nightly chapter reading! I look forward to reading "I Love You Stinky Face" to my daughter at night because she loves when I say "mama what if I was an alligator with big sharp teeth!" and growl and tickle her. My son loves How Do Dinosaurs Say Goodnight and I Dreamt I Was A Dinosaur. A friend got him some dinosaur magnets for his 2nd birthday, so he has been learning the names of all the dinosaurs. I think its hilarious that he can say Diplodocus. But his favorite is T-Rex! Love You Forever. It was my favorite as a child and I still love it to this day...such a beautiful story!! I cant wait to read The Faraway Tree Stories by Enid Blyton to my kids as I have only Enid Blyton to thank for introducing to me the wonderful and fascinating world of books. I love the idea of fantastical friends living in a tree and visiting weird and wonderful lands. There will always be adventures waiting for them, whatever happens; funny, magical adventures that will delight children again and again. I loved the sheer use of imagination throughout this book...it's exciting ways leaves you wanting to read more and more. Enid Blyton and The Faraway tree will always have a special place in my heart. If You Give a Moose a Muffin Big Book by Laura Joffe Numeroff and Felicia Bond. My son will not go to sleep without me reading him "My Dad Loves Me!" by Marianne Richmond It's a simple book we read together. It shows a different father and child animal on each page doing something special. He shows me the "baby" and the Daddy" in each picture... and we act out the gesture. It's a great bonding book. It was actually given to me for my newborn by someone at work but he's not ready for it yet... but my 2 year old loves it. I love to read I See Me.... She loves the pictures and I love the message that everything is a mirror for who she really is. GOODNIGHT MOON was my favorite to read to my son, now it's my favorite to read to my grandchildren. Such a classic for sweet dreams. Definitely 'Where The Wild Things Are" and everything else by Maurice Sendak. Shel Silverstien a close second! I was a wild child and my husband has a boundless imagination, so I want to read books that make my kids realize anything is possible, but also that family and closeness are important. I love love love "Sometimes I like to Curl up in a Ball." I've read it every night for 2 years!!!! The bedtime stories I most look forward to reading to my three year-old son are, naturally, those that elicit the greatest, most animated reaction from him. He likes a great story, but for him the visuals are just as important as the narrative itself. So we gravitate towards highly detailed, graphically-rich books like Richard Scary�s �What Do People Do All Day� or Maurice Sendak�s �Some Swell Pup.� Through these, his imagination takes the furthest flight, as we depart from the story and he takes over the narrative, asking "what's this?" and "why that." I hope to read her my own illlustrated story someday. I hope to write a multi-cultural children's story which can be translated to many languages and is read in two at a time to encourage bilinguism in young children. I have illustrated a children's book previously but now that I am going to have a child of my own, I know she will be an inspiration and I look forward to reading it to her at night after she has given it her approval and it is in it's first edition. Goodnight Moon was always a favorite of my twins. It wasn't too long winded, it had a rhyming scheme, and my daughters were able to remember the words. My cousin just gave birth to a boy and I plan to read him that book too. Knuffle Bunny, We have your bunny! Our baby boy is only a few weeks old but we look forward to reading many books to him. We've started with The Childrens Bible. Right now the favourite stories in our house are Baby Colours, Mr Brown Can Moo and Goodnight Moon. Goodnight Moon, because it is charming. Good Night Moon will always be a classic and special to me. I love Goodnight Gorilla! I get to make up the story as we go and the illustrations are so sweet and colorful. Such a cute goodnight book. I like to write and have some children's books of my own so I look forward to being able to read those. I am also a huge fan of Dr Seuss so will read all of his great works at some stage also. 'The snail and the whale' by julia donaldson, wonderful rythymn to fall to sleep to, and wonderful pictures to stay awake to! Definitely The Giving Tree. I love the story and the message, and little ones find it boring enough that they fall asleep! Last book is the wonderful, simple, Good Night Moon, preceded by several beforehand. Goodnight Gorilla is a great one! Oh The Places You'll Go, by Dr. Suess. My son adores that book! "Papa, Please get the Moon for me" by Eric Carle. I love reading it to my toddler son, who loves opening up the fold out pages and saying "wow" everytime. Super cute to see someone so little get into reading! The Three Little Pigs, Connor loves the "blow your house down" when I use my Wolf voicce. Our favorite bedtime book is 'The Going to bed Book' by Sandra Boynton. Little man always begs for one more no matter how many books we read. Goodnight moon! Because we love the moon!! Little Golden Books because I remember how much I enjoyed them as a child, especially the Christmas stories. Love you forever..my favorite all time book for children. read it to my kids and my grandkids. I can't wait to read "Daddy is Home", "Grown-up Day", and "Donkey-Donkey" to my little one! I also liked both pages on facebook, and subscribed to the newsletter. My girls and I read a variety every night, but we always seem to include "Papa Get the Moon for Me" by Eric Carle and "Runaway Bunny" by Margret Wise Brown....two of my favorite childrens book authors. We usually read "Brown Bear" and then "Good Night Moon". I hope to win! I liked both pages on facebook and subscribed to the newsletter. My 3 year old LOVES Chicka Chicka Boom Boom. And hte baby enjoys listening to Daddy read it to big sister! Goodnight Moon because it gets them calmed down and ready for bed and is such a classic. We love to read pajama time! We love to read Where The Wild hings Are. We enjoy how much my son likes to hear the story over and over. It is the perfect story to read to my wild little boy! we read goodnight moon and B by sarah kay every night after bathtime. My daughter is 18 months, and really does love her night time rituals. I am looking forward to my husband reading us all the Harry Potter books after our next child is born in a few months. He did that when our son was born. When You Give A Pig A Party - all 4 kids love, despite their age difference! When little Amelia makes her debut, I look forward to having my son read to her from "A Child's Garden of Verses" that has a variety of little stories to choose from... But I'm sure he'll prefer to read "Perry Poops" because it makes him laugh! Good Night Moon was always my all time favorite book to read to my children. Good Night Moon was always my children's favorite book to read. The Adventures of Pinocchio because we don't hear enough truth. I look forward to reading Where the Wild Things Are because it encourages children to use their imagination, to let go of their comfort zone and embrace the unknown and because it is an awesome story! What a great invention for babies and toddlers, looks so relaxing, I wanna thank the inventor for this wonderful Idea, well to all good luck ! We look forward to any Little Bear books at bedtime! The pictures are so lovely and warm. We love On the Night You Were Born. My first is 16 months and some abnormal ultrasounds gave us a good scare during pregnancy. It still makes me tear up when I read it to my perfectly healthy little man! I love reading Duck and Goose Find a Pumpkin by Tad Hills. The illustration and text is adorable, it's easy for my daughter to follow along, and it's getting her ready for Halloween. We usually read it a few times before we move on to the next book. I love reading The Very Hungry Caterpillar by Eric Carle to my Mr 2.5 years. He loves to join in, since he knows the words by heart now. I can't wait to read it to #2, whenever he or she may come to be! This is such an awesome prize! Our favorite bedtime story (we read our 22 month old 2 books, goodnight moon and buenas noches a todos) is buenas noches a todos by Sandra Boynton. I love that the story follows his bedtime routine (except for the exercise on deck). He feels connected to the characters and the routine has made bedtime anything but a battle! I can't wait to start reading this book to my second son, due next week, 10/23! We love Bear snores on, because it's cute. I look Forward to reading our 4 month old son Ke'ohi Professor Noah's spaceship, a book I had as a kid. It tells about how the earth was getting polluted and the animals didn't know what to do. Owl says he saw a great invention and the man who built it must know how to help. They go find professor Noah, who has built a spaceship to take the animals and himself to a new world in the future which is not polluted. They accidentally go to the past though, but it is still not polluted. It's such a colorful book & even though he doesn't understand it yet, it has a powerful message I am glad he will grow up learning. The Giving Tree because it is one of the best memories for me growing up as a child. That little green book with the little red apple, the tall tree and the little boy forever stick in my mind when I think of a child's book. It didn't matter how old anyone was in the family - it was read to all and a lot. This little book has been passed on to my nieces and nephew as well. A wonderful book at any age!! Although our tiny little flower child is still in mommy's tummy, her little ears can still hear. That's why mommy and daddy like to read " where the wild things are" before bed. This book teaches children to be themselves and to express individuality. It also teaches children to have a creative imagination. We want our baby to grow up and be who they are meant to be, not who the world expects them to be. I love you as big as the world " David Van Buren". I love this book and cannot wait to read it to my precious litttle princess because I love her because she is mine, and because she is a beautiful gift to both my husband and I. As the book says " I love you because you are you", and I will love her because she is who she is. Such a wonderful message to share with your child, that you love them. Without love there is nothing! There are soo many great books I could choose but I definitely have to go with Goodnight Moon. I love this book!! I used to read it to my baby brother almost every night when he went to bed. I'm really looking forward to reading it to my lil one when he is born. I loved reading "Goodnight Moon". When they got old enough to talk, they would say the sentences when I would pause. This hammock looks and sounds so neat....just perfect for a newborn and I was so excited when it popped up that I could enter a chance to win it! I was extremely disappointed to learn that this was from 2012 and had expired as well as the discount. You might want to consider updating your site and maybe even consider running another new contest. Sleep is the Holy Grail of parenthood -- yet most new moms and dads are shocked by how elusive slumber becomes once baby arrives. The designers at Hushamok know how important it is for moms, dads and newborns to catch some shut-eye, so they created a dreamy sleeping haven for baby in their Organic Baby Hammock and Stand.�Designed to provide a cozy transition to life outside the womb, Hushamok's organic hammock is an ingenious alternative to baby bassinets or cribs. The hammock's natural swinging and rocking motion helps induce sleep and enables baby to sleep longer. Babies suffering from infant colic and reflux will also be especially comforted and relieved by the constant swaying motion. �The hammock comes with two matching organic sheets, and a mattress that is entirely free of�flame retardants.�The stand is crafted from sustainably harvested European Beechwood, a wood chosen especially for its wear-resistance and strength, and is held together with aluminum castings, which receive top marks for durability, recyclability and sustainability. Hushamok's hammock and stand's sleek design also makes it a gorgeous, aesthetically pleasing addition to any space.